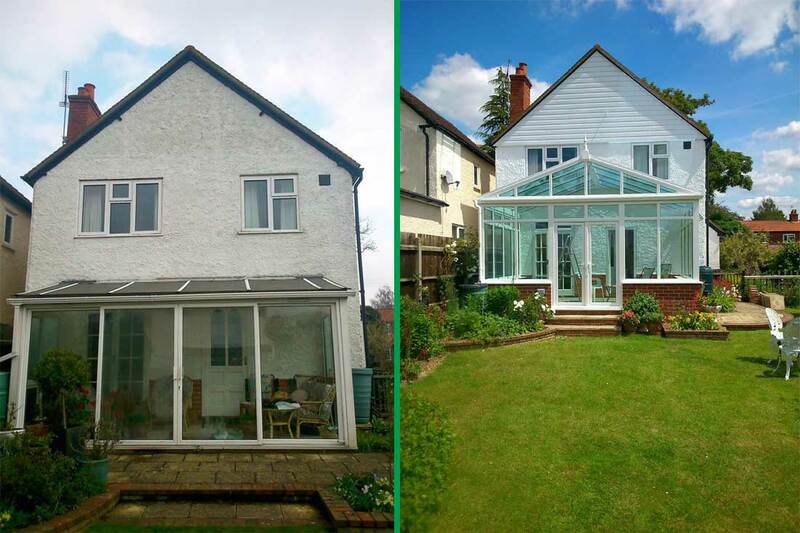 A couple in Reading have recently chosen a stunning uPVC Conservatory upgrade for their Reading Home. 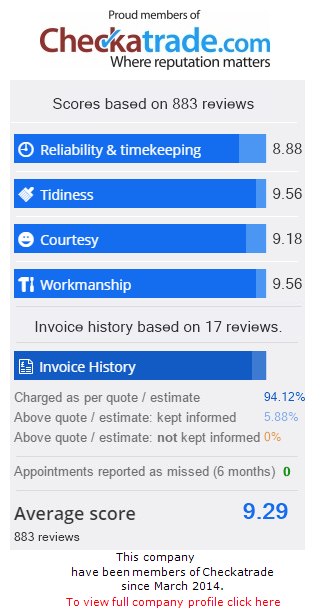 Their old, flat-roofed leaking conservatory has been skilfully replaced by our expert conservatory installation team to a sophisticated Gable End Conservatory. 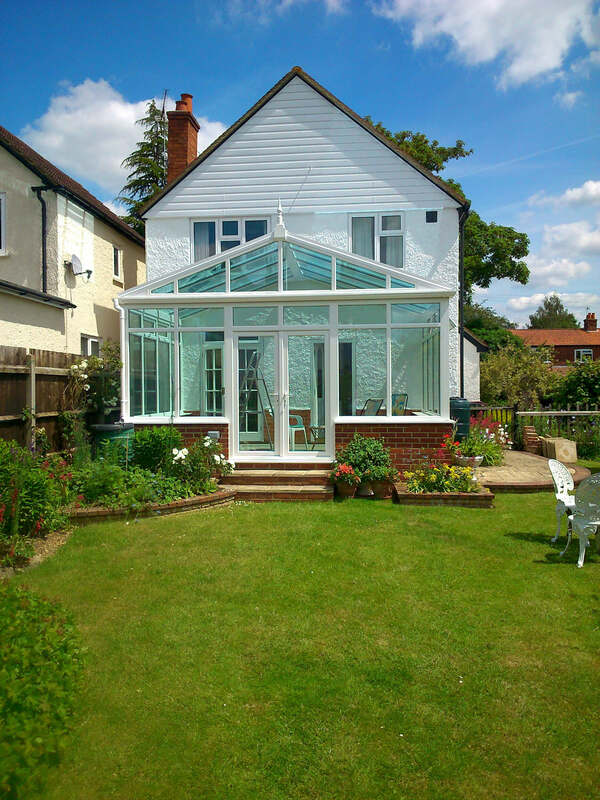 This stylish and charming style of uPVC Conservatory has completely rejuvenated their Whitley home whilst maintaining the authentic charm of their character property. The couple’s flat-roofed uPVC conservatory had been in place for over twenty-five years, but a leaking roof and a frame which let in draughts meant the outdated structure could no longer be the hub of their Reading home. With seven grandchildren, the couple were now looking for a room with functionality. A space that could be used throughout the seasons, whatever the weather. Our double glazing team talked through the exciting conservatory styles we have to offer including our bespoke conservatory styles. It was important to the couple that we keep to a similar footprint to the original uPVC Conservatory. Together we began to design the couple’s ideal conservatory, in keeping with the look and feel of their Reading home. A brand new conservatory plan was drawn up with a number of amendments to enhance the look of the Reading home. The new plans would bring the uPVC Conservatory up to date, whilst retaining the lines of the house. The couple opted for a stunning Gable End Conservatory; a modern style of uPVC Conservatory offering maximum space and height within the room. 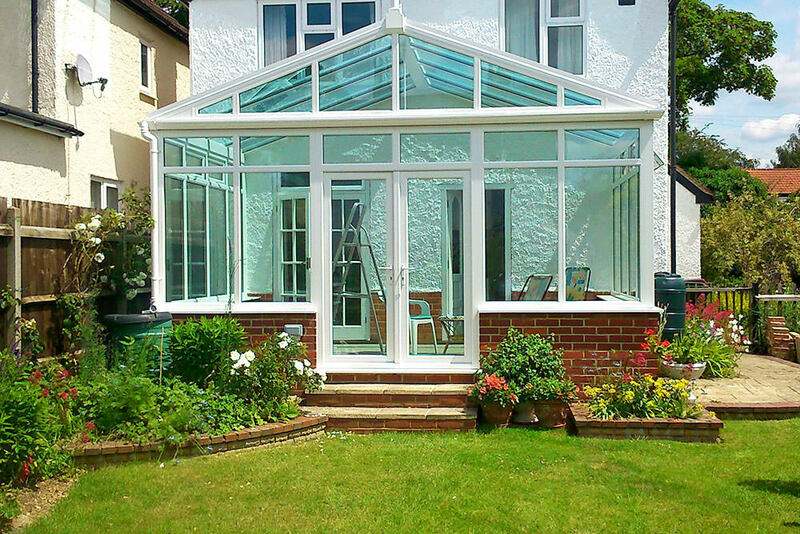 The double glazed front window panel of this cleverly designed uPVC Conservatory remains upright rather than sloping back towards the centre. This, coupled with the new high-angled double glazed roof, maximises light and creates a feeling of great height within the uPVC Conservatory. Check out the before and after photographs below. The conservatory roof replacement will further improve the functionality of the new uPVC Conservatory in Reading. We wished to give the couple climate control with high performance glass. The old, leaking roof was replaced with an UltraFrame double glazed roof, providing the couple with a uPVC Conservatory they can use all year round. No longer will this family room be hot in summer and cold in winter, with the innovative four-season double glazing. The Abbey Conservatory installation team lastly fitted a pair of stylish uPVC French Doors from Liniar into the new uPVC Conservatory. An elegant addition allowing easy access to the garden on hot summer days. We built practical hardware into the uPVC Conservatory design allowing the new uPVC French Doors to be easily latched back on a windy day. 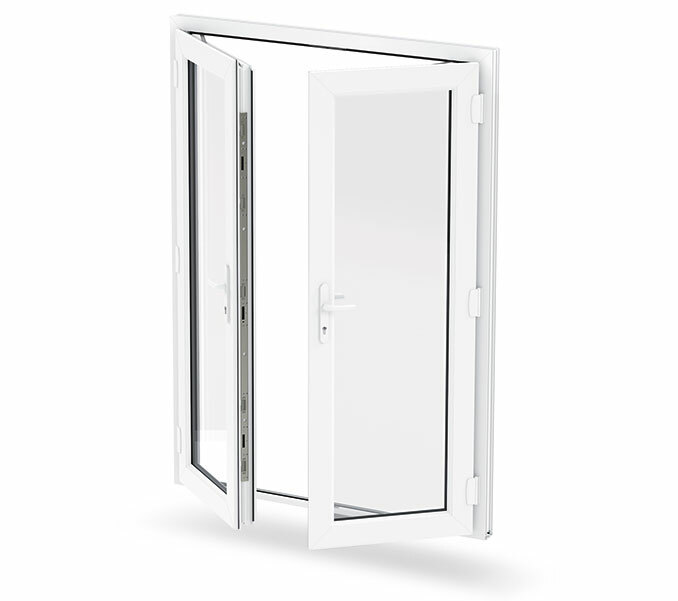 Further security features were included with a Yale Lockmaster multipoint lock incorporated into the uPVC French Doors, the ultimate shield against would-be intruders. The couple worked with Abbey in a dynamic fashion, getting involved with all details to find a solution which would suit both their Whitley home and their living style. The verdict, a success! The couple can enjoy their new uPVC Conservatory to the full, all year round. The couple are particularly pleased in the size and feeling of spaciousness in the new conservatory. Having previously had pinoleum blinds on the uPVC Windows, the couple have delayed their decision to put new conservatory blinds in. Simply appreciating the bright, airy feel of their new living space. The conservatory is now used as a family room and is certainly the new heart of their Reading home. Inspired by our conservatory success story? Get instant online conservatory prices today with our free and easy to use conservatory quoting engine. Alternatively, get in contact with our friendly team here at Abbey Windows to find out more.